Arsene Wenger has revealed that Arsenal tried to sign former Manchester City star Jadon Sancho before he made his way to Borussia Dortmund. In a beIN Sports UEFA Champions League Matchday show, Arsene Wenger has disclosed that Arsenal were once interested in signing Jadon Sancho before he joined Borussia Dortmund from Manchester City in the summer of 2017. Sancho had left Manchester City in search of regular first-team football, and his decision was vindicated in just a year after he made his way to the Bundesliga heavyweights. While the teenage prodigy made only 12 Bundesliga appearances in his first season at Westfalenstadion, he has become indispensable in his second campaign at Dortmund. The 18-year-old has made 18 appearances across all competitions this season, making quite an impression with a tally of 8 goals and 13 assists. But, Sancho could well have been an Arsenal player when he left Manchester City, if Arsene Wenger had his way. 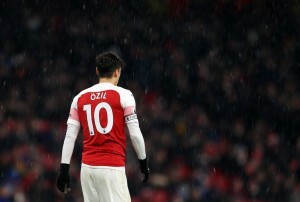 The former Arsenal manager told beIN Sports while appearing as a pundit during Dortmund’s UEFA Champions League Round of 16 first leg tie with Tottenham on Wednesday, where he was full of praise for the English winger and revealed that the Gunners were keen on signing him. Indeed, Arsenal were reportedly the favourites to sign Sancho from City before Dortmund swooped him away instead. The move has been quite a success for the 18-year-old, who has been one of the most prolific contributors in Europe this season and has even gone on to make his debut for England owing to his exploits for Die Schwarzgelben. More remarkably, Sancho is now seen as a flag bearer of the next generation of senior footballers – a generation of players that do not shy away from moving abroad while still in their developmental stage. Sancho’s lead has been followed by the likes of Reiss Nelson and Ademola Lookman, while Aaron Wan-Bissaka has also been recently linked with Borussia Dortmund. As far as Arsenal are concerned, a player like Sancho could have potentially been quite an asset in the first-team squad, with the Gunners bereft of natural wide men. But, Arsenal’s – and Manchester City’s – loss is Borussia Dortmund’s gain, with the teenager going from strength to strength at Signal Iduna Park.